When opening the links of locations on this site, please choose the alternative "Maastotietokanta" to get the map open. is located Mansikkaharju Camping and Tourist Center Unnukka with its shops and marina that provides mooring and other services. There are walking paths along the shoreline which lead to the Sport & Spa Hotel Vesileppis. This area provides a wide selection of activities all year round. The stone church, built in 1846 is the seventh largest Lutheran church in Finland. The church is also a popular concert venue. to the Leppävirta river and to the center of Leppävirta. The unobstructed overhead clearance of the bridge is an impressive 26 meters. The Konnus canal area consists of three canals and five sections of rapids. The rapids area features duckboards, docks and a lean-to. The canal restaurant Konnustupa serves visitors. Almost 3 000 different ethnologically and historically valuable items varying from household items to weapons, and hunting and fishing gear. An eco-friendly adventure park that has been built among living trees without causing them any damage. The park will be opened in Spring 2017. The park is open even during the winter holidays (weather permitting) and it is open for group reservations all year round. The park features zip lines, swings, cable bridges, lianas and is suitable for adventurers who are over 130 cm tall. The Orinoro Gorge is listed as one of the Seven Wonders of the Savo Region. At the bottom of the 200m long and almost 20m deep Gorge there is a natural spring, and snow and ice remain there as late as June. 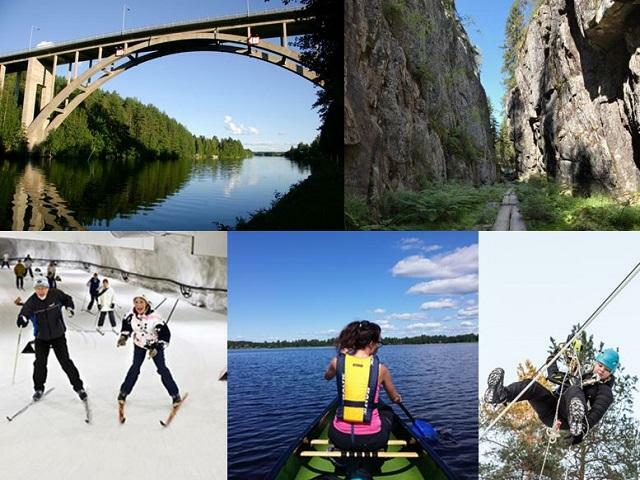 There's a 7km long hiking trail in the proximity of the gorge and this trail provides an excellent overview of the different types of beautiful nature present in the Savo region. In addition, the trail features a lean-to and a hut where you can enjoy food amongst the beautiful and peaceful nature. The trail also passes Mustinmäki hill and from the top of it, you get a great panoramic view of the surrounding area. For independent travelers and paddlers. The untouchable nature and the protected islands are a sight by themselves. The pre-historic rock painting of Ukkokivi Rock The pre-historic rock painting of Ukkokivi Rock and the Kuvajanniemi Cave are located in the northern part of Lake Sorsavesi. The southern part of the lake features, for example, the rugged Linnasaari Island and the massive Karhunkivet Rocks. At 155m, Nikkilänmäki provides great views and the Museum road, parallel to Highway 5 is a few kilometers long and portrays a piece of traditional landscape of the Finnish countryside. Ski Arena is a versatile winter world and it is the largest of its kind in the world and it lies in the bedrock, 30 meters below the hotel Vesileppis reception. The compound consists of the actual Arena main hall and a tunnel. The total length of the skiing trail is 1,1 km and the Arena’s temperature is approx. -1 ° to -5 °C, depending on the season. Ski Arena is available for lease for sports clubs' regular practice shifts. The Arena features ski trails for both classic and free-style. You can also kicksled and there’s even room for biathlon training.